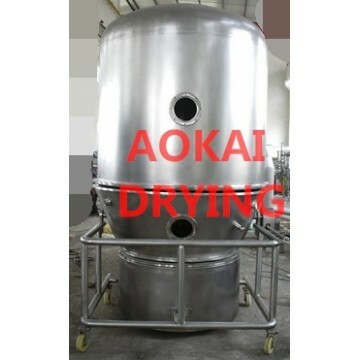 It is suitable for medicine, food, feed, chemical industry and so on, suit for drying the powder which has good fluidity. When air is purified and heated, it is introduced from the bottom of exhaust fan and passes through screen plate of raw material. In working chamber, the state of fluidization is formed through stirring and negative pressure. The moisture is evaporated and removed rapidly and raw material is dried quickly. 1. The structure of fluid bed is of round so as to avoid dead corner. Inside the hopper there is a stir in order to avoid agglomeration of raw material and forming canal of flow. (Small machine does not support stirrer). 2. The granule is discharged through the method of turning over. In this way, it is very convenient and quickly. Discharging system can be designed by requirement. 3. It is operated at the conditions of negative pressure and seal. The air is filtered. Therefore it is simple in operation and convenient in cleaning. It is ideal equipment that is in conformity with the requirement of GMP. 4. The drying speed is fast and temperature is uniform. In general the drying time is 20-30 minutes.